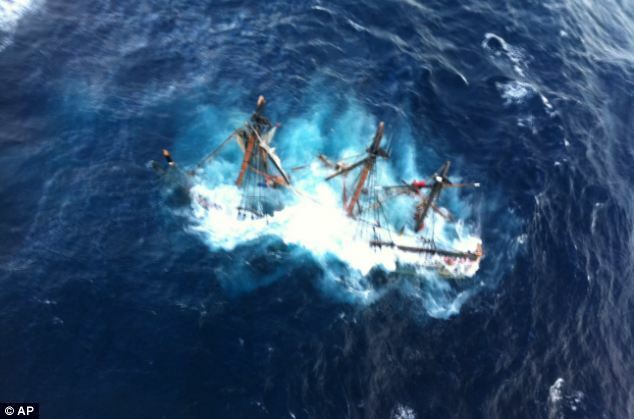 The crew of HMS Bounty was forced to abandon ship off North Carolina coast yesterday as it became caught in raging seas near the eye of Hurricane Sandy while the captain remains missing, presumed dead. It now means 15 of the 16 crew members of the iconic boat are accounted for – with 63-year-old captain Robin Walbridge yet to be found. Two coast guard helicopters rescued 14 people from life rafts after they were forced to abandon ship. As six-metre waves and ferocious gales battered the decks of the 180-foot, three-masted ship – knocking out its power – terrified crew-members clambered into life boats to watch their floating home shrink unmanned into the darkness. However, following the rescue of 14 crew members, two people – including the ship’s captain – were missing at sea. The world-famous boat- which featured in Hollywood blockbusters Mutiny on the Bounty with Marlon Brando and two Pirates of the Caribbean films, starring Johnny Depp – became stranded on Sunday night about 90 miles southeast of Hatteras, North Carolina. The crew were picked hours later up by a search and rescue team who were dispatched by helicopter to bring them to safety. But fears were confirmed that this was indeed the final voyage of the historic replica after the coast guard said it did not have time to retrieve her before conditions became too dangerous. “The 17 person crew donned cold water survival suits and lifejackets before launching in two 25-man lifeboats with canopies,” the Coast Guard said in a statement. The ship was built in Lunenburg, Nova Scotia for the 1962 movie Mutiny on the Bounty that starred Marlon Brando. It is a replica of the British Navy’s original HMS Bounty on which the famous mutiny took place in Tahiti in 1789 and is now used as a sailing school for prospective seafarers. It was built using the original ship drawings from files in the British admiralty archives, but its dimensions were enlarged by around a third to fit the enormous 70 mm cameras used in the filming. Some 400,000 feet of lumber were used, 10,000 square yards of canvas were sewn by hand and 10 miles of rope were rigged before it was ready for the silver screen. The plan was to burn the ship in a dramatic final act, but Marlon Brando had become so attached to the vessel that he threatened to walk out in protest so, rather than lose their star, its owners MGM agreed to keep it in service. It has since become one of Hollywood’s most famous ships and was used in filming for the 1989 film Treasure Island with Charlton Heston and also appeared in two of the Pirates of the Caribbean movies, Dead Man’s Chest and At World’s End, both starring Johnny Depp and Keira Knightley. This year it was put up for sale by its current owners for $4.6 million.